I guess it’s Polish Heritage week in our household. Mike recently bought me a Russian, Polish & German cookbook at the library book sale. Kelsey thought we should try some of the recipes. Fried dough? How could we go wrong. 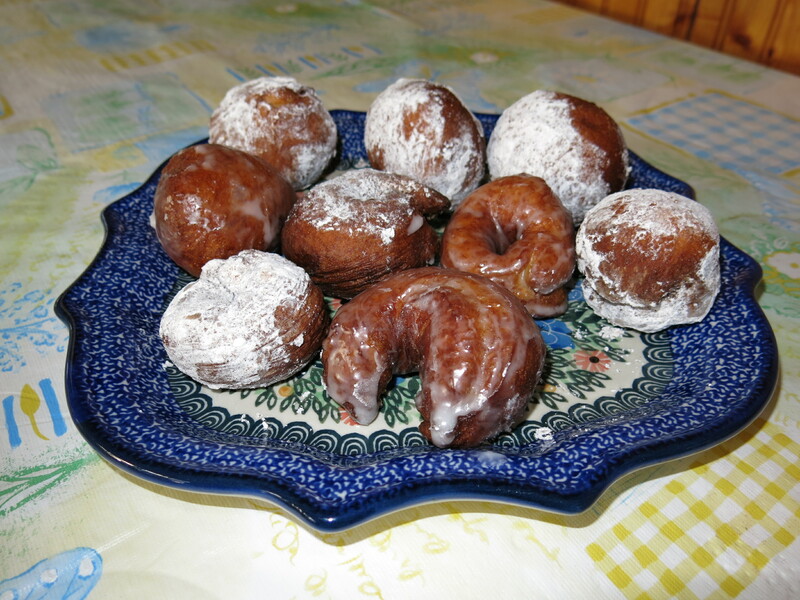 Mom always said that doughnuts were a Polish food. Yum! In a medium bowl stir together flour, salt, and yeast. Make a well in the center and the egg, milk and sugar. Mix well to form a soft dough. Add more milk if necessary to make a smooth dough but not sticky. Beat well, cover with plastic wrap and allow to rise until double, about 1-1 1/2 hours. Knead dough on a lightly floured surface. Divide into 10-12 pieces. For jelly filled doughnuts, shape pieces into a a round disk. Put a tsp. of jam in the center. Dampen the edges with water and fold the them up and around the jam, pressing to ensure the jam will not escape (easier said than done). Place on a greased baking sheet and allow to rise for 15 minutes. For rings, roll a piece of dough into a thick snake and press ends together. Place on baking sheet and allow to rise 15 minutes. Heat oil in a large saucepan to 350F. Fry the doughnuts 5-10 minutes until golden brown. Drain on paper towels. Mix powdered sugar and cinnamon on a small plate and use to coat doughnuts. For glazed doughnuts, mix powdered sugar with 1-2 tsp. water to make a thick slurry. Dip the doughnuts into the sugar syrup.